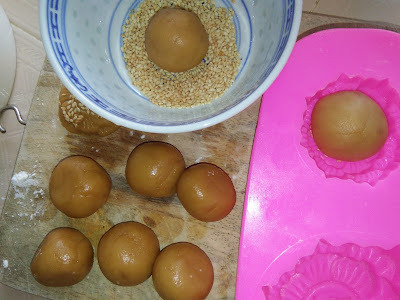 This doll [figurine] mooncake dough recipe is similar to my earlier posting Peach Doll Mooncakes. As mentioned in my earlier post, this dough recipe is a keeper. You can make use of it to make any shapes of your choices and is endless. Aunty Young has made numerous lovely doll mooncakes with this dough which is easy to handle and mould. The dough is soft and moist, does not stick to the mould. Here, I have used a small size mooncake mould to shape the dough with sesame seeds topping. 1 egg + 1 tbsp milk, mix well and strained. 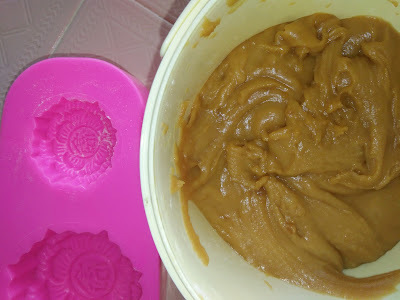 In a mixing bowl, add in syrup, peanut oil, alkaline water and lotus seed paste. Stir mix until well combine. Add in sifted flour and form dough. Cover the dough with a cloth and rest for 2 - 3 hours. 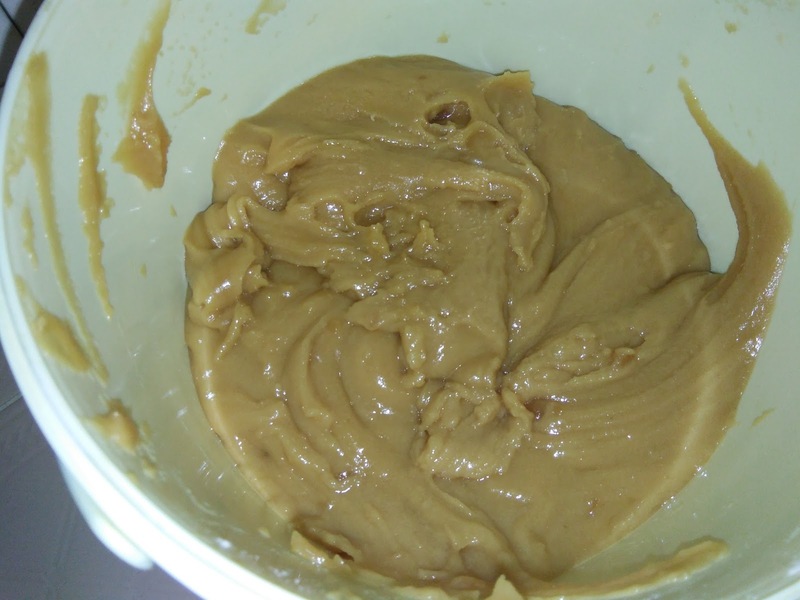 Divide the dough into portions that fits the mould you are using. Roll each into a ball. 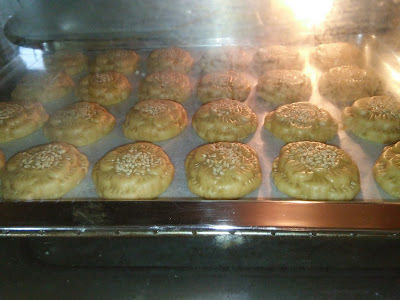 Press in some sesame seeds. Press the dough into the plastic mould. Tap lightly to unmould. 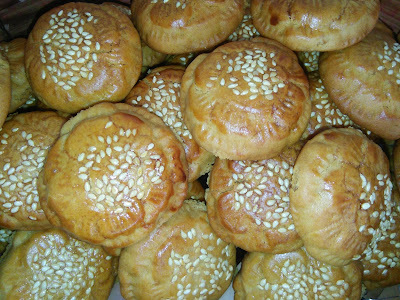 Arrange in a baking tray. 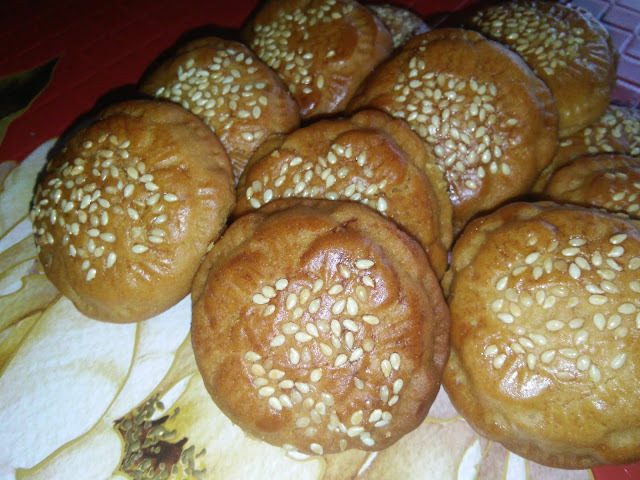 For vegetarian version, bake mooncake in preheated oven at 160 degrees C for 20-25 minutes or until golden brown. 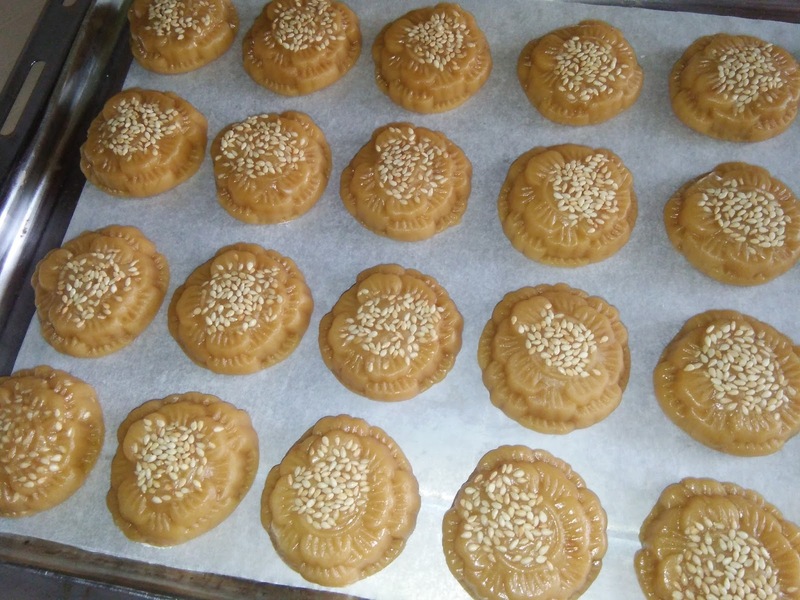 After allowing the mooncake to cool on a metal rack, it can be kept in an air-tight container. It can be kept up to weeks if it is dry enough after baking. For non-vegetarian version, bake mooncake for 10 minutes, remove from oven, leave tray of mooncake to cool for 10-15 minutes. Apply sparingly egg glaze. Return to oven and bake for another 10 minutes or until golden brown. Remove to cool in a tray before storing. 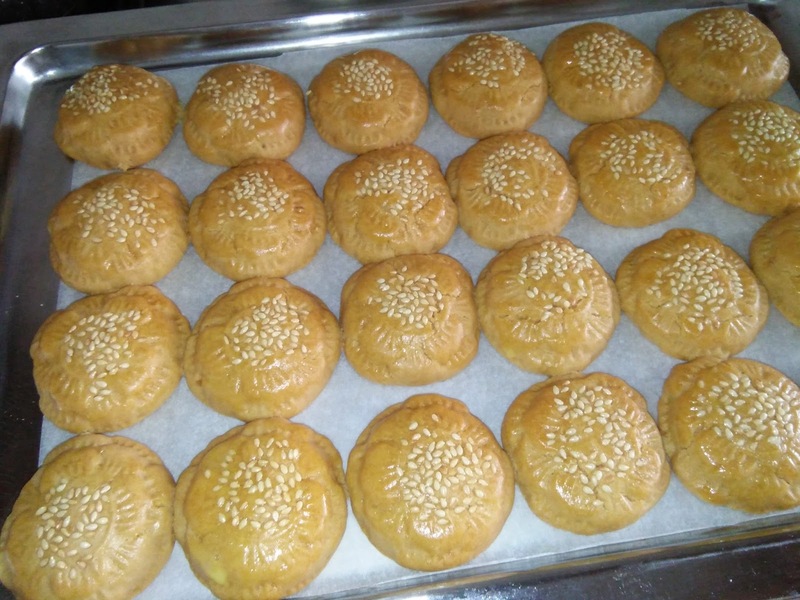 Mooncake will be soft after resting for several days. 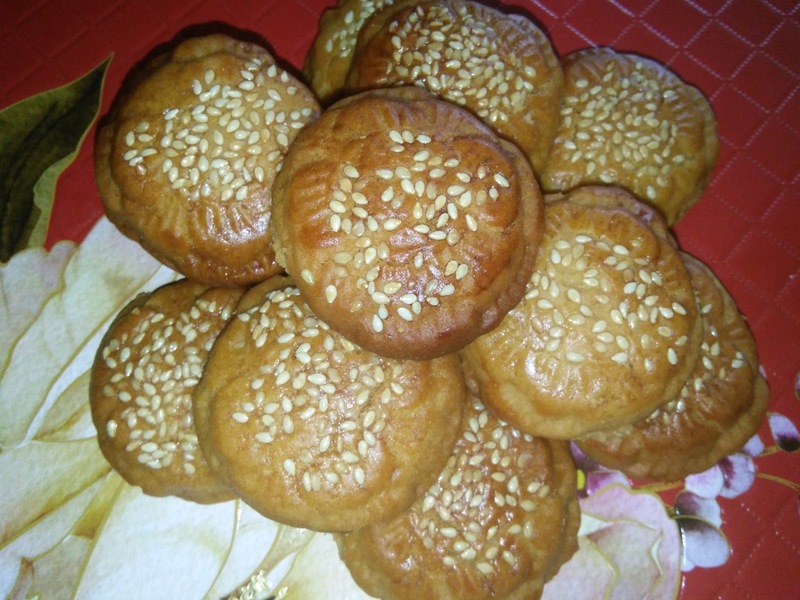 Hi Phong Hong, this is a lovely doll mooncake recipe where the dough is easy to handle and not sticky. 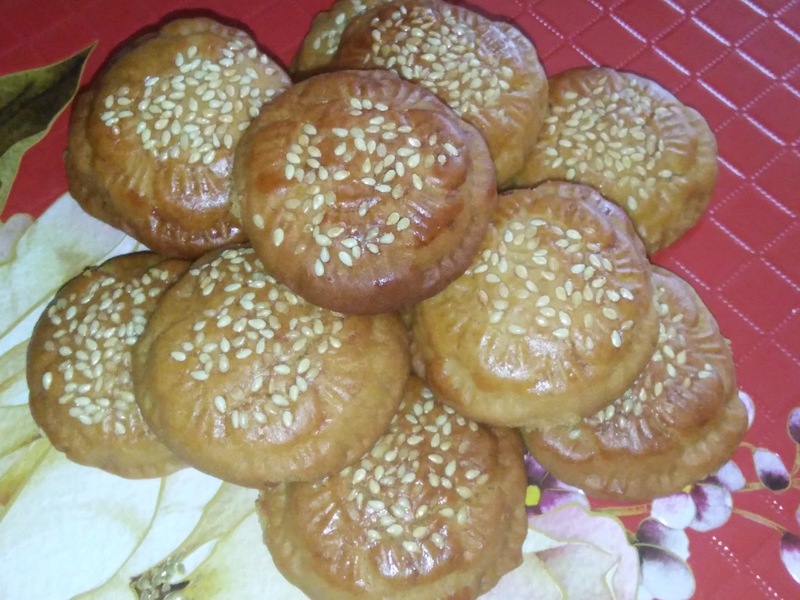 The biscuits are soft and aromatic after airing for several days, not too sweet and do not stick to the teeth.